Conquest of the Irrational is a contemporary painting of a great egret in flight by wildlife artist Kent Paulette. The large egret is white and it is taking off over water. There are splashes in the blue water and the background is dark colors with pops of yellow and orange. This modern art has elements of Cubism and Action Painting mixed with K. Paulette’s own unique style. 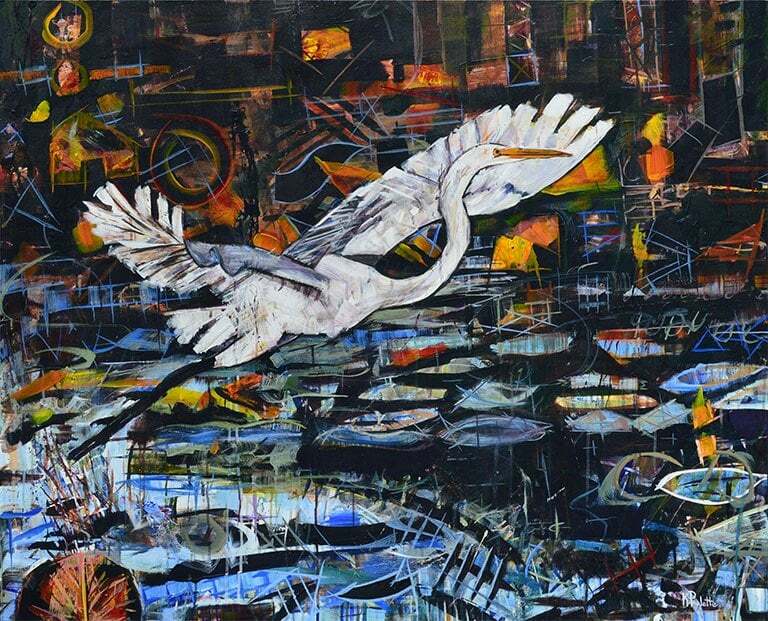 This great egret painting is loved by his collectors who buy art and it features his Windows brushstrokes. The white flying bird is also called a common egret or great white heron. They can be found in Florida as well as North Carolina. Paulette saw one on the lake where he lives in the NC High Country. Some people think it’s a crane because of its white feathers. Conquest of the Irrational is a contemporary wildlife painting that is for sale and has a stained glass style. The movement of the great egret taking off from the water is very dramatic. There are geometric shapes in the water which Boone, NC artist Kent Paulette created using angular lines. This abstract art of animals in the wild is colorful and creative. This was the first original painting that he created at his home studio in March 2015 after years of painting at Studio 140 in Banner Elk.